Purpose: Use this document as a reference for enrolling staff into Savings Plans in ctcLink. You must know the EMPLID or name of the employee you want to enroll, enter their ID in the Empl ID field. If there is a previously saved row, then it will be necessary to add a row in the Coverage sub-tab by clicking the (+) button on the right hand side of the screen. 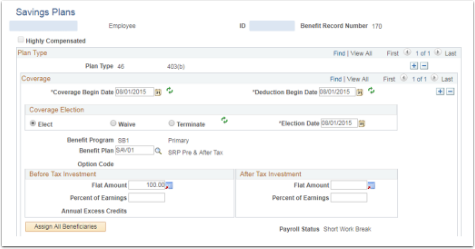 Deduction Begin Date is when you want Payroll to begin looking at the screen in order to determine if a deduction will be taken from a pay period’s check. This will typically be the first day of a viable pay period. In the Before Tax Investment or After Tax Investment boxes, enter either the Flat Amount or the Percent of Earnings as needed according to the employee’s choice. From the Assign all Beneficiaries button and below, there is no other entry needed on this page. Beneficiaries, Investments, and Rollover Options are not configured in our PeopleSoft system at this time. Limits for Savings Plans are contained in configuration and maintained by SBCTC as needed. Limit tables, as they are configuration, are not accessible by college Benefits Administrators. If there is a question or concern regarding them in production a Benefits Admin should always send a ticket through the Service Desk.